AT&T and Time Warner think their $85 billion merger makes strategic sense. Now comes the tough part -- convincing skeptical investors that the deal won't be the second coming of AOL Time Warner. The stocks of both companies fell after the opening bell: Time Warner lost 3% and AT&T dropped 2%. In fact AT&T is offering $107.50 a share, but Time Warner was below $88 Monday morning. Why? It's because AT&T is paying cash for half of the deal. The remainder will be financed with stock. AT&T's stock is falling -- and dragging down Time Warner -- due to concerns the deal could fall apart following what is expected to be intense regulatory scrutiny. 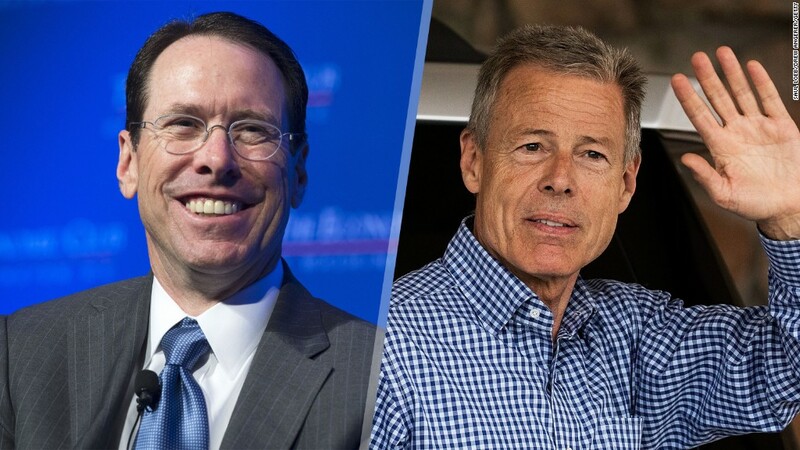 AT&T (T) CEO Randall Stephenson and Time Warner (TWX) chief executive Jeff Bewkes addressed analysts and investors on a conference call Monday morning. "We're convinced this combination of Time Warner and AT&T is a perfect match for both companies," Stephenson said during the call. He added the two companies will have a strong presence in sports, thanks to Time Warner's deals with Major League Baseball, the NBA and the NCAA for March Madness in addition to AT&T's ownership of DirecTV and the NFL Sunday Ticket service. The call followed a media blitz by Stephenson and Bewkes earlier Monday to discuss and defend the deal, which would unite Ma Bell and its more than 130 million wireless subscribers in the U.S. with the owner of HBO, TNT, and, yes, CNN and CNNMoney. AT&T's stock has fallen more than 7% since rumors about a possible tie-up started to circulate on Thursday. Wall Street doesn't seem to think the marriage of AT&T and Time Warner is a smart move -- particularly at this price. AT&T's $107.50 a share offer for the company is 19% higher than where Time Warner's stock is trading currently, and 35% over where it was before the rumors started. Investors seem worried that AT&T may be spending too much for Time Warner and that the financial and strategic benefits won't be as significant as Stephenson has promised. Stephenson even joked, in response to a question from BofA analyst David Barden about the merger, that he has never run a Hollywood studio. The comment seemed to be a way for Stephenson to reassure analysts (and perhaps Time Warner employees) that AT&T would not make major changes at Time Warner. Stephenson seems to realize he will need help running a media conglomerate. But the deal also seems to be reminding some of the massive merger between AOL and Time Warner back in 2000. That is now acknowledged as one of the least successful in history and was completely undone years later. AOL was ultimately spun off. It's now owned by Verizon (VZ). Time Warner Cable was also spun off, and it is now part of cable giant Charter Communications (CHTR). Magazine and book publisher Time Inc. (TIME) is also now an independent company. Tom Eagan, an analyst with Telsey Advisory Group, said in a report it was unclear that owning Time Warner content made much financial sense since AT&T already offers it to its subscribers. Or as he put it, "why buy the cow when you get the milk for free?" Craig Moffett and Michael Nathanson of MoffettNathanson added that the deal lacked both synergies and "strategic logic." Moffett and Nathanson added that the deal is about giving AT&T new revenue streams in the media and entertainment businesses. That's not the worst idea in the world, but they think that the price is simply too high. AT&T is proposing a price that values Time Warner at more than 12 times 2017 estimates for earnings before interest, taxes depreciation and amortization or EBITDA -- a key measure of profits used to value media companies. By way of comparison, cable giant Comcast (CMCSA) bought NBCUniversal for about 9 times EBITDA estimates back in 2009. Analysts are also worried about the massive amount of debt that the combined company would have -- potentially as much as $175 billion following the closing of the deal. But AT&T CFO John Stephens said during the call that the company will generate enough free cash flow to keep paying down its debt and maintain its investment grade corporate bond rating. He conceded though that the amount of debt is "large." Analysts also seem concerned about whether AT&T is biting off more than it can chew right now. Amir Rozwadowski of Barclays asked Stephenson why AT&T was looking to do such a big deal right now when it is still in the process of integrating DirecTV. Stephenson said he was confident that the heavy lifting involved with DirecTV would be done by the end of 2017 -- which is when he also expected the Time Warner deal to be finalized following regulatory reviews and votes by the two companies' shareholders. At the end of the day, Stephenson said he thinks more mergers between distribution and content companies are going to take place. He didn't want AT&T to be playing catchup with Verizon, Comcast and other rivals. "We want to be at the front of this. We don't want to be chasing it," Stephenson said.